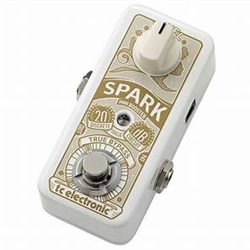 Kick on the TC Electronic Spark Mini boost pedal to send your guitar amplifier into glorious overdrive. Or just use it as a clean boost for a subtle volume increase during solos. Either way, the Spark Mini packs premium analog circuitry that won't degrade your tone. Even better, there's two ways to use this boost pedal - kick it on and off like any other pedal, or just hold the footswitch for a momentary boost.